To achieve a significant number of fusion reactions, the reactants must be heated at high temperature (10keV-100keV) in order to overcome Coulomb repulsion between positively charged nuclei. At these temperatures, electrons are no longer attached to atoms, and the state of matter is called "plasma". Since plasma is composed of free charged particles it can be confined by intense magnetic fields. defined as the ratio between the fusion power Pfus and the auxiliary power Paux needed to heat the plasma, depends on the amount of energy lost through radiation (in the following we will only consider Bremsstrahlung) and thermal conduction. The latter are usually quantified in terms of the so-called "energy confinement time" rE defined, in steady-state conditions, as the ratio between the energy content of the plasma and the heating power. Self-sustained conditions (Q = 1) are achieved when the fusion power released in the form of charged particles confined by the magnetic field balances the energy losses of the configuration and no auxiliary power is necessary. Driven fusion operation (already achieved in many fusion facilities) is instead associated with a finite value of the auxiliary power and therefore of the fusion gain Q.
charge; Tj is the temperature of the jth species; kBr = 1.69 x 10 MW(eV) / ; and r is the energy confinement time. The above conditions define the value of ner as a function of temperature associated with a given fusion gain Q. In general, optimal values of the concentrations n//ne can be found that minimize the ner value. Note that the values of the fraction fi/ depends both on the fraction of fusion energy released in the form of charged particles and on the capability of the configuration to confine them in the region where fusion reactions occur. Equations (B.7) determine the ner value only for the case of thermal equilibrium among all species. In such a case all the species (electrons and ions) relax to a Maxwellian distribution function with the same temperature T. The reactivity for this case is given by the usual Maxwellian reactivity shown in Figure B.2. The ner value as a function of temperature is shown in Figure B.3. The curves show a vertical asymptote for T = Tideal, the ideal ignition temperature below which fusion power is lower than the power lost by Bremsstrahlung. A broad minimum of ner is achieved around an optimal value of temperature Topt. For much larger values of T, reactivity decreases and ner must be raised. 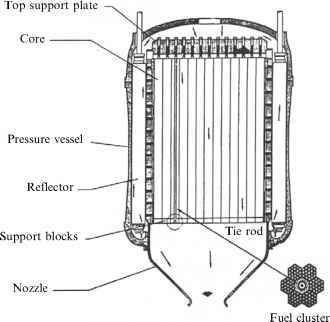 The case of fully thermalized plasma (Te = Ti) allows self-sustained operation only for the D-T, D-3He, and D-D reactions. In addition to the pure D-D cycle, the so-called "catalyzed DD'' cycle, in which a small amount of T is added to the D fuel and then recovered through the D-D cycle, is often considered. — The electron temperature cannot be arbitrarily small, since energetic particles (injected by external methods or produced by fusion reactions) would be slowed down on a very fast timescale by collisions with electrons. 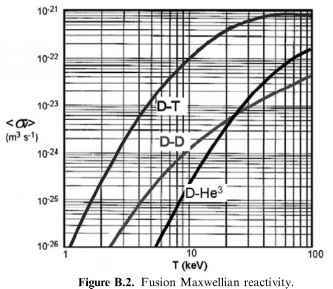 — Fusion reactivity must be evaluated by the appropriate distribution functions for the reacting species (typically a slowing-down distribution function for externally injected beams).